The Autonomous SmartDesk 2, Business Edition, shortly after assembly. It’s probably an overstatement, and it’s become cliché, but there’s enough truth to it that it bears repeating: Sitting is the new smoking. And so when shopping for a desk, the smart money is on sit-stand. There are, obviously, simple standing desks. I have two problems with these. One, standing can become as monotonous as sitting. Two, I’m a writer and work odd hours, which means I play odd hours – in my case, this can mean going for a run over lunch. After running 6-7 miles, I typically want to take a load off my legs. So whatever the solution, it would have to be a sit-stand desk. 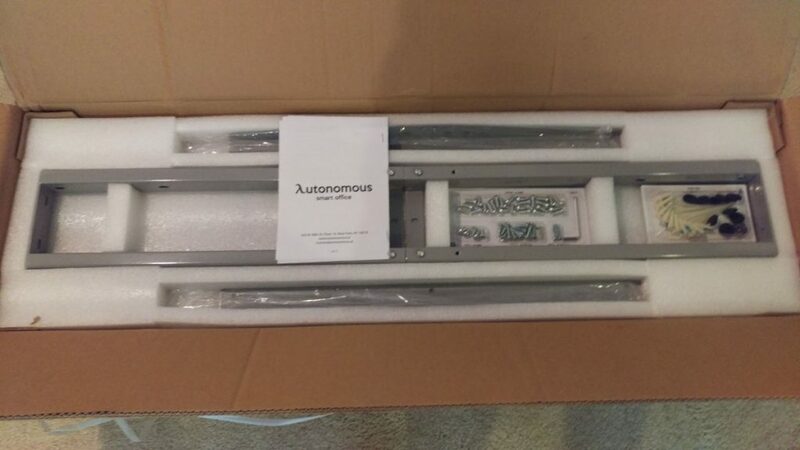 The folks at Autonomous sent me the equivalent of a review copy of such a desk. 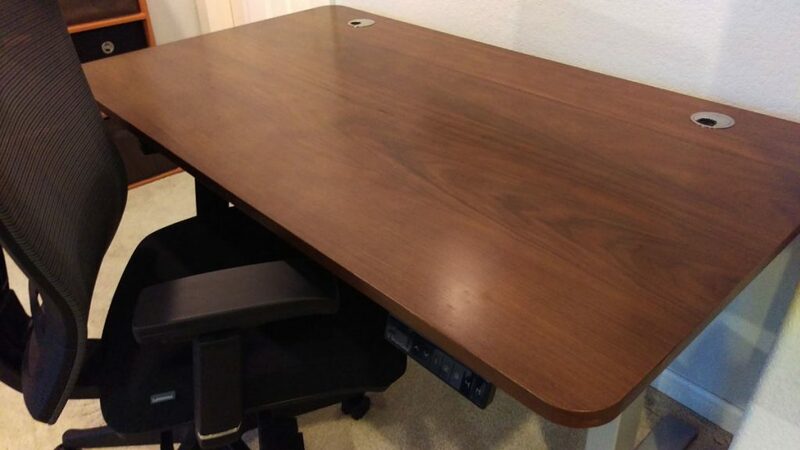 In this case, it’s a 53-inch by 30-inch, walnut surfaced, grey-undercarriaged SmartDesk 2 Standing Desk Business Edition (the link defaults to the $299 Home Edition; the Business Edition retails for $399 and pops up when you scroll down a slight bit and click on the Business Edition option; shipping and handling is $49 for either one). At about 29 inches, just right for sitting. The Home and Business Editions look the same. The difference is under the hood, so to speak: the Home Edition has a single motor that moves the desktop up and down from 29 inches to 47 inches, with a 220 pound capacity and a one-year warranty. The Business Edition on which I now type sports dual motors and rises from 24 inches to 51 inches, with a 300-pound capacity and a five-year warranty. Another difference between the two, and perhaps decisive to the highly impatient, is that the Business Edition moves up and down 2.3 times faster than the Home Edition’s one inch per second. And at 51 inches, roughly armpit height for the average American adult male, and well into power-forward territory as far as standing-desk height. Unless you’re using Olympic plates as monitor stand, I have a hard time imagining why one would need the extra 80 pounds of desktop weight capacity. Being able to go as low as about two feet could well benefit folks with small children, as that’s low enough for the tiniest of chairs. On the other end, I can tell you that 51 inches is up to roughly the armpits of a 5’10” adult male. For the record, someone my height will probably find the 40-42 inch range maximally comfortable – I’m at 42.1 inches as I stand right now. While writing the previous paragraph, I was at 29.1 inches. As far as the speed of motion, 2.3 inches per second may or may not sound like a lot, but it’s about a foot every five seconds, which is pretty damn fast, as the below video shows. 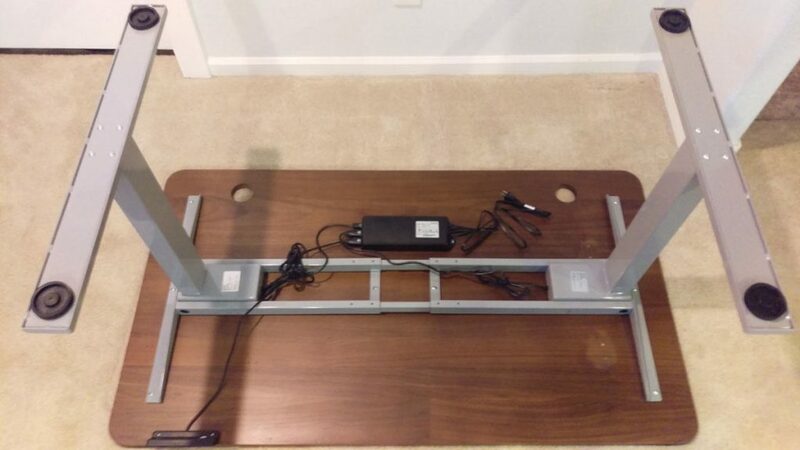 While functionally similar, I will say that having electric motors do the work is much more satisfying than manually raising and lowering the Varidesk I use in another workspace. It also allows for leaning on the desk, which Varidesk users do at their peril while standing. In addition to the manual up-down controls on a sleek black keypad anchored to the bottom of the desk, there are four preset options. You set these by raising or lowering the desk to the desired height, holding a button labeled “M” until the LED displaying this height starts to blink, and then pressing one of four buttons labeled 1 through 4. I’ve set two, at 42.1 inches and 29.1 inches. Press a button and, 10 seconds of quiet whirring later, the table arrives at the desired height like a dog much more obedient than mine. I imagine that, in an office environment, this feature might attract pranksters – who could, say, change my 29.1-inch preset 1 to the maximum 51 inches. I will not be teaching my daughters about the presets. 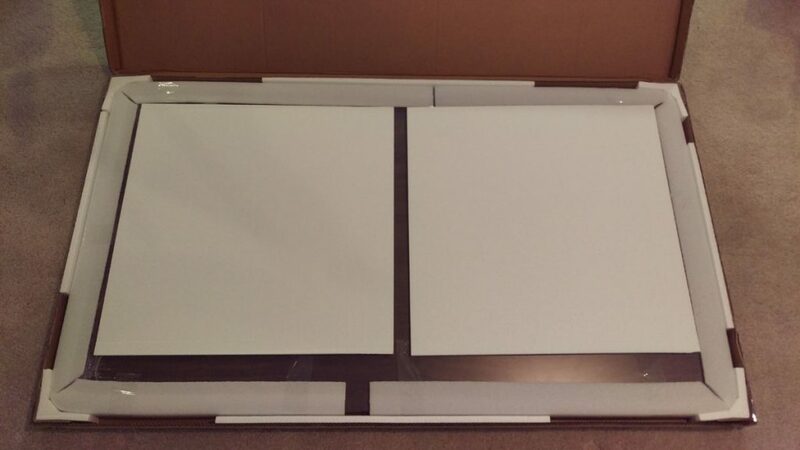 Otherwise, from a functional perspective, the SmartDesk 2 Business Edition is solidly built, looks sleek, has nice silvery caps in the far corners for plugs and other wires to descend through. Weighing in at probably 80-90 pounds, it doesn’t move at all with my typing despite being on carpet. In all, this is a very nice product to use. The question you might have, then, is how easy or hard it was to assemble. So let’s talk about that. 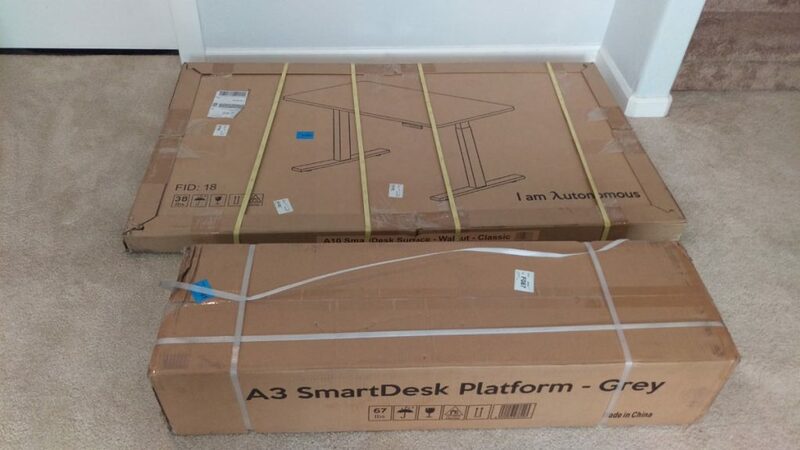 Probably the hardest thing about assembling the SmartDesk 2 will be getting in into your dwelling. That’s not all that difficult, either, really, thanks to the fact that it arrives in two boxes: The first, 38 pounds, holds the desktop; the second, 67 pounds, contains the legs, feet, motor(s), and control electronics. The desktop is unwieldy but not all that heavy; the legs etc. box is heavy but small enough to allow leverage. I moved them both around solo without a problem. I will not drag you through the entire assembly process, which took just over an hour. My experience assembling various Ikea furniture was probably helpful, but this is straightforward, step-by-step stuff. The printed instructions sufficed; had they not, there are videos on the Autonomous website. I did take a few photos, which I’ll drop below. I will say that, unlike Ikea furniture, I assembled this with a sort of Christmas-morning anticipation, one which heightened right off the bat when I noted that the dual motors are called, technically, linear actuators. But you don’t rush these assembly experiences, I’ve learned from various Ikea fails (none cataclysmic). It all came together with impressive precision, and as with my Ikea constructions, I’m confident that the bolts are tight, having tightened them myself. 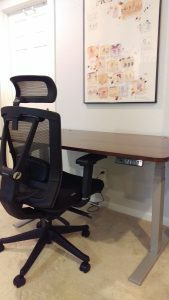 Bottom line: This is an attractive, robust piece of office furniture that looks great and is easy on both body and budget. With that, I leave you with a few assembly-related images. The SmartDesk in its travel duds. The desktop upon opening of the box. The packaging, particularly around the edges, is damn-near bulletproof. The undercarriage box upon opening. Lots of heavy foam padding here. The desk, a little over an hour later, assembled and ready to go. The linear actuators are at the top of each leg, connected to the control box (center), which in turn is connected to the keypad (lower left). 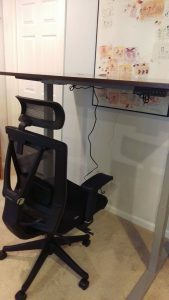 It is critical, at this point, to turn the desk over to enjoy optimum functionality. Note that Autonomous sends along cable stays for the truly organized; I made due with the twisty ties that had bound the cables during shipment.